Olney doc muses: Holiday reads-Shackleton! I really love the chance to get stuck into some good books whilst on holiday. I recently managed five, all rather different, whilst lounging in the sun and shade. First up, one of my heroes. 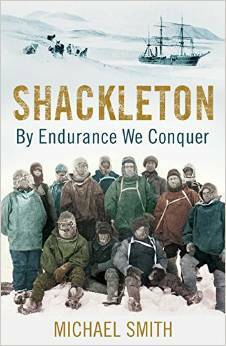 Shackleton By Endurance we Conquer by Michael Wilson. I'm a big fan of all things Shackleton and have enjoyed reading previous accounts of the remarkable Endurance expedition and especially the rescue of the guys left at Elephant Island. Leadership insights from Shackleton in the book Shackleton's way has been a previous favourite. This relatively new biography (2014) is a great read. It provides a rounded picture of the man who was able to overcome truly hopeless odds in the extremis of polar exploration, but he was plainly just never able to settle into 'normal life' away from the pole. His rather casual approach to family and marriage, his many business ventures and failures, his chaotic approach to money and fundraising and his rushed planning of expeditions are all well described. However although hopeless with money, Shackleton was not greedy and was frequently generous with money he could ill afford to part with. He nonetheless had a charismatic personality that lead many wealthy donors to support his various exploits. The retelling of the Endurance journey and especially the stunning improvisation and courage shown by Shackleton and his men is brilliantly described. To read again of the journey of the James Caird, a mere 7m long and 2m across, with 6 men on board needing to sail 800 miles across the mountainous swells of the Southern Ocean-and all in the hope that they could locate rescue ships to go back for the 22 men remaining on Elephant Island-was both exhilarating and humbling. And then the need for Shackleton, with Worsley and Crean to hike across South Georgia, with just 3 days food supply. Its stirring stuff. If there were touches of genius about his leadership, they could be found in the way that Shackleton held together a disparate group of men in appalling conditions, making sure that disruptive cliques were not formed, and that everyone was treated equally. He never took unnecessary risk, was able to adapt to the constantly changing circumstances, and never asked a man to do something he would not do himself. But Shackleton's supreme achievement was that he instilled hope, and the belief that they would all service. Magnificent book. Ok its over 400 pages, but superbly written.